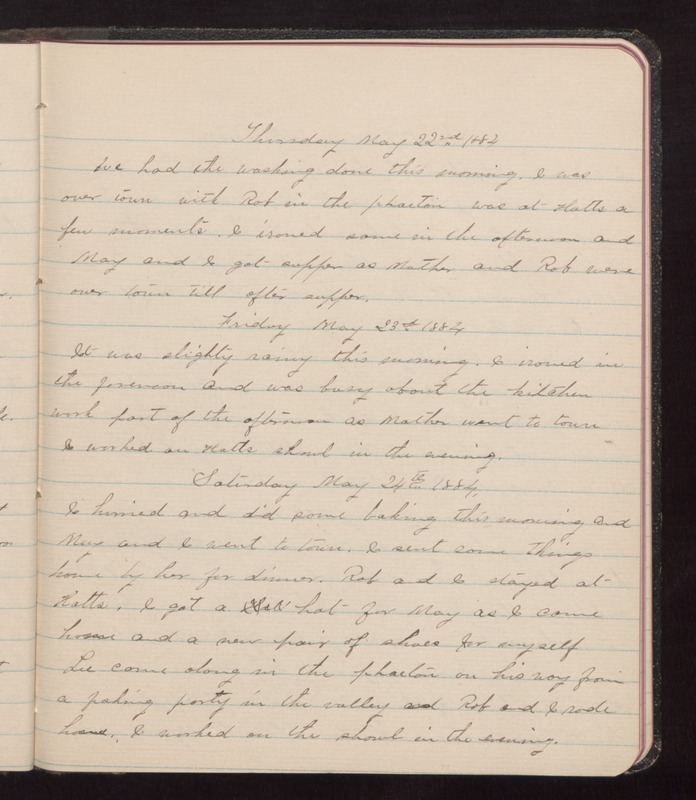 Thursday May 22nd 1884 We had the washing done this morning. I was over town with Rob in the phaeton was at Hatts a few moments. I ironed some in the afternoon and May and I got supper as Mother and Rob were over town till after supper. Friday May 23rd 1884 It was slightly rainy this morning. I ironed in the forenoon and was busy about the kitchen work part of the afternoon as Mother went to town I worked on Hatts shawl in the evening. Saturday May 24th 1884. I hurried and did some baking this morning and May and I went to town. I sent some things home by her for dinner. Rob and I stayed at Hatts. I got a hat for May as I came home and a new pair of shoes for myself Lee came along in the phaeton on his way from a fishing party in the valley and Rob and I rode home. I worked on the shawl in the evening.